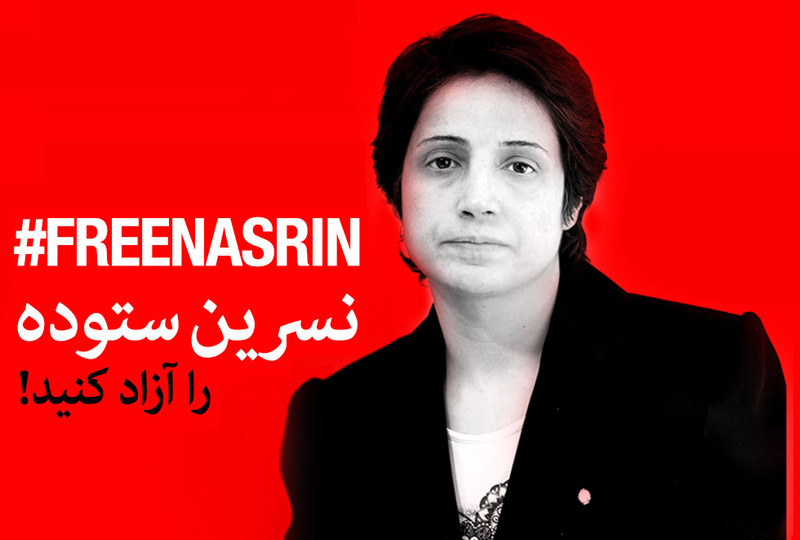 Prominent defense attorney Nasrin Sotoudeh has gone on hunger strike and refused to appear in court to protest her unjust detainment in Iran's Evin Prison and the harassment of her family members and associates by security agents. "In my meeting with Nasrin in prison today [August 26], she gave me the news that because she had refused to appear at a hearing, the assistant prosecutor in the case, Mr. Nasiripour, and two other judicial authorities spoke to her in the Women's Ward and informed her of the new charges," her husband, Reza Khandan. told the Center for Human Rights in Iran (CHRI). According to Khandan, Sotoudeh was also informed of three new charges-"urging a referendum," "assisting the formation of home churches" and "organizing protest rallies"-in addition to the five others she was already facing: "insulting the supreme leader," "assembly and collusion against national security," "forming groups against national security" and "propaganda against the state" and "espionage in hiding." Sotoudeh is appealing the five-year prison sentence that was issued to her in absentia for the fifth charge. Security agents raided Sotoudeh's home and those of her sister-in-law Fatemeh Khandan and civil rights activist Mohammad Reza Farhadpour on August 18. "Given that my communications with the authorities have not born any results, inevitably, I will start a hunger strike on August 25, 2018, to protest various detentions and pressures by the judiciary against my family, associates and friends," she wrote in a note posted by Khandan on Facebook. "Since my detention two months ago, agents of the Intelligence Ministry have not only illegally detained the esteemed physician Dr. Farhad Meysami, but also searched the homes of my family and friends to find pins made to protest forced hijab," she added. The raid was carried out by three agents of Iran's Intelligence Ministry who had a warrant from Branch 7 of the Revolutionary Court in Evin Prison in Tehran. Sotoudeh has been detained in Tehran's Evin Prison since June 13, 2018, and is facing national security charges for serving as the lawyer of detainees held on politically motivated charges, including women who have taken off their headscarves in public as a form of civil disobedience. On August 22, 60 members of the European Parliament called on Iranian President Hassan Rouhani to forcefully work for Sotoudeh's "unconditional release." Seven other human rights lawyers have also been arrested, summoned to court or blocked from taking on clients since February 2018 in a crackdown aimed at disabling defense attorneys from properly defending detainees held on political charges.